I felt so proud of checking off the last priority thing on my Evernote daily to-do list yesterday that I had to screencap it to preserve the productivity goodness for all time. While I was at it, I thought I’d share my Evernote to-do list setup and how I use it in my daily process as someone who works in marketing. The note pictured is the one by which I live each and every workday—entitled VITAL PROJECTS. For those who wonder how I use Evernote to guide my day, this is one of the key parts—the main projects list. The amount of time this linking saves is astonishing—not just because it’s that much easier than opening up a browser and THEN clicking a bookmark, but because of the brainpower needed to make it from, “I need to do X now,” and “I’m actively working on X now.” As anyone who works in marketing will tell you (especially those who work at marketing agencies, and not client-side), the trail between those two things can sometimes get derailed from a phone call, email, walk-by conversation or even the browser itself when it opens and I get sidetracked on some other site. This is DOUBLY true of Facebook, Twitter and LinkedIn. Since I use those social media networks constantly as part of my job, I need to open them in order to access client accounts, and if you’ve ever gone on Facebook with a particular objective in mind, you know how easily you can get derailed from your purpose. It’s the daily real struggle of all marketers. Direct links to the actual place I need to go for each task. And a CHECK! after each one. The second half of my list is a regular old To-Do List — superpowered with those links for immediate context. You can see the “ME” link, which brings me to the “Me / Today” view in Basecamp, where our project managers have prioritized the list and added notes and documents. This Basecamp “Me” view is nice, but has control limitations, which is why I started making my own list in Evernote. I bold the priority items that absolutely need to get done that day, and the remaining tasks are what I will work on if I have time at the end of the day. This is just the tip of my personal marketing productivity workflow iceberg, but I thought it would be fun to showcase. Maybe next time I’ll show you a partially-pixelated view of what is underneath that top part of VITAL PROJECTS note—a detailed status list (with links, of course) to all client and internal projects that I’m involved with. I don’t know where I’d be without it. Let me know how YOU use Evernote to Remember Everything — particularly if you work in marketing. 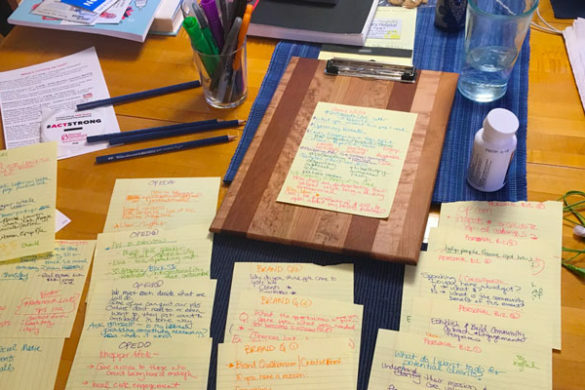 A marketer’s daily to-do list is a fascinating and ever-evolving system. I’d love to hear yours! Baby, it’s really, really cold outside.